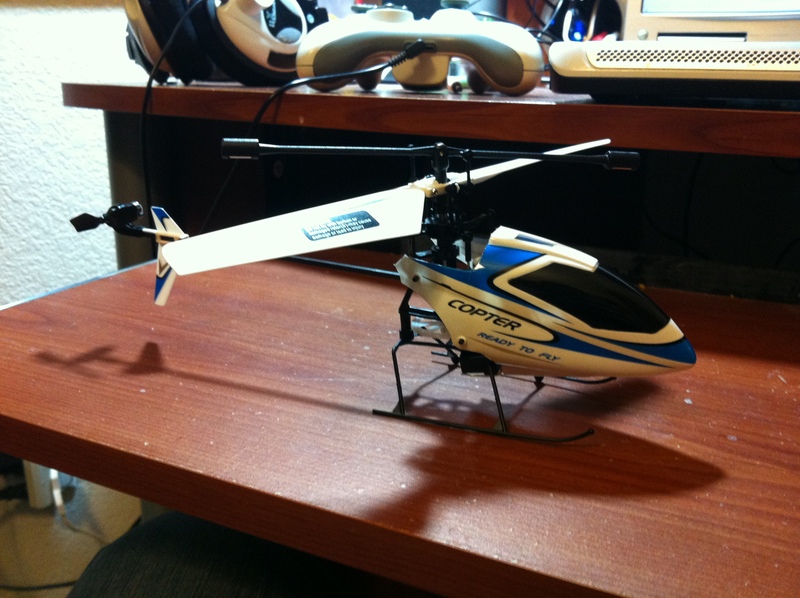 This past Christmas I received a 3.5 channel Co-Axial helicopter as a present. One of those Mall Specials with the vertical third prop on the tail to control forward and backward flight. I've really enjoyed flying it, but am left wanting more, despite my advancing skill with it. My question now is "What's next"? Inspired by the recent "Heli-Path" video I am now torn between getting a Fixed-pitch heli (like the Blade SR120 or mSR) or getting a Collective Pitch (like the Blade mCPX2). I noticed that Josh (Scott) seemed to have the same amount of trouble with both of them. A fixed-pitch is the logical next step, but I feel like I may be looking for more after to long. When it comes to performance/ maneuverability what are the advantages of a Collective Pitch heli over a Fixed Pitch heli? I'm not looking to get into 3D flying, yet, but I think it would be nice to be able to at some point. I HIGHLY recommend spending some time with a fixed pitch heli such as an MSR. I have taken this trip already and I now fly a 400 and a nitro heli is in the works. The collective pitch helis are very unforgiving and expensive to repair. The fixed pitch models have an inherent stability designed into them that helps you learn. The collective pitch helil's are designed to be very very responsive and the nature of the design makes them fast to respond, with no self correcting tendencies at all. You would be much better off flying an MSR for a while before moving up. I still have fun with my MSR so it's not like you can't grow with it for quite a while. The type of helicopter you are describing has very limited controls (correct me if I'm wrong). You have throttle for elevation, rudder (which changes the speed of the main blades) and the rear rotor tilts the heli forward or back. It basically drives like a truck. You push forward and turn left and right. The fixed pitch helis have true cyclic control which allows them to control the rotor disc to achieve forward and back as well as left and right and your tail rotor acts like a real tail rotor. This is much harder to control and allows you vastly more maneuverability than what you have now. I think you will find a good fixed pitch to be more than enough for quite some time. +1 ... Fixed Pitch for sure. It was a GWS Dragonfly that did it for me through that phase before playing with a Blade 400. Thanks for the reply, and for explaining the differences between Fixed and Collective Pitch. It's true that the Heli I currently have is very limited in it's controls. I actually found it difficult to control at first because of this limitation. I've found that the main reason I would crash, or run into things, with it was due to this lack of control. With all that in mind it does sound like a Fixed Pitch is the next step for me. Thanks for the help guys! No problem. Welcome to the forum by the way. As always, let us know if you have any questions. very good post Ak Flyer, I also spent months with an MSr, then a 120SR when I started flying outdoors, the MSr is a great heli, I wish I still had mine. I started slightly backwards. My first heli was a Trex 450. I loved it and had no problems flying that. But as we have a lot of wind here i got an MSR to fly indoors. It gave me tonnes of confidence with all orientations and improved my flying of the 450. My upgrade arrived today. A china special: WL-Toys v911. It's a 4ch micro heli based off the Trex 100. It's missing some of the features, but at less than $50 shipped it's a good deal. It'll take me a bit to get used to it. I'm used to mode 1 I think (throttle on the left, forward/backward and rudder on the right), so getting used to the new controls is taking some time. The biggest difference is how fast it responds. The UJ378 was slow in both speed and input reaction. This little thing is a bolt when you need it to be. It also hovers with a lot less stick compared to the UJ. While the UJ required over half stick to hover (probably due to it's metal frame) the v911 requires next to nothing. This makes rudder inputs a bit hard since my thumb is further back. I'm basically having to re-learn how to fly again, get my bearings, correct the nose direction, getting used to the strafing movement. I think it'll be a good heli to gain some skills on. HAHA I just got a great idea, for those small helis, so you don't break them, stretch up a blanket somehow and fly the heli over that - so if you crash you don't break it. I guess tall grass or a large bed would have a similar effect. A fixed pitch is a great next step. I would also recommend getting a flight simulator before going to collective pitch. I learned without a sim and know first hand how expensive it can get crashing every outing. +1 for flight sim before going to collective pitch. I did and I'm so very glad I did. I have a feeling I won't be going collective for a while. Fixed was the right way to go for me. If I had started out with a coaxial that had Mode 2 controls I may be brave enough to take on a mini collective... but coming from a Mode 1 3.5 channel coaxial, picking up the new control layout is proving to be a bit of a mind bender. I'm starting to get the hang of it (a couple flights in), but I keep moving the throttle when I use the rudder. This wouldn't really be so bad if my current fly zone wasn't so small. Since it's currently raining I'm restricted to indoor flying. Which pretty much consists of a 15-20' box only 5-6' high (the joys of apartment living). The upshot is it should breed good throttle control, I hope. It's a fairly durable heli. I've had it go tumbling across the floor and smack into walls a couple times. No worse for the wear, but it sounds like the motor could use some oil (a common issue from my research). The motors aren't becoming overly warm or anything, but the main motor sounds a bit "dry". I used to run RC cars so I know when a motor needs a service. The controls you have now are pretty much the standard. The only difference going to CP will be the addition of pitch control. That really only comes into play when you start using the idle up mode where the throttle is set and your throttle/rudder becomes pitch/rudder. What you have now though will definitely help you along. Good to hear you're happy with it. +1 for the v911 heli (hobbyking fp100). I learned flying with this. It is a very durable and easy to fly heli, very stable and you can connect the control linkages to the swashplate for fast or precise response. I've bound it to my 9x and it flies great now. Well I've had some adventures with this little Heli over the last few weeks. I've lost a flybar weight and broken the landing gear, but it still flys really good. The flybar weight was lost when it smacked into the pavement after a fast dive pass that I didn't quite pull out of. The landing gear broke when I lost it for a second over the back of our apartment building (dang wind). I was fortunate enough to find it, right it remotely through feathering of the throttle and could fly it back up to our third floor balcony. Lucky me. I'm looking into replacing the flybar all together. The weight I used to replace the lost one isn't quite the same size so I'm a bit aerodynamically unbalanced. I'm planning on assembling a paddled carbon fiber flybar from Solo Pro 260 and MSR parts (flybar comes from the Solo Pro 260, paddles from the MSR). Hope fully that will help it stabilize a bit better and reduce flybar strikes. I've noticed something, and maybe this is true of all single rotor helis; it likes to rotate in one direction more than the other. I've found that when I'm doing coordinated turns I can turn tighter and tighter in one direction, but I reach a "turn limit" in the other. Is this just a nature of the beast thing? There is a natural tendency for the helicopter to want to rotate opposite of the way the blades are turning. That's in all helicopters. The tail strength or as commonly referred to as authority, is the ability of the tail to hold when it's supposed to, and create the turn when you tell it to. Micro helis usually have a separate motor and these are always slow to react compared to a variable pitch driven tail such as a belt or torque tube. They can't have the same responsiveness as a driven tail. One reason is that most of them only power the tail to react in one direction and in the other direction the motor slows or turns off. In a driven tail you will actually drive the tail the other direction by changing the pitch. I would say it's just a characteristic of your heli but you may not notice it in others or not as bad. Most 3D helis have such a high rate of spin that you won't even be able to tell if it's going faster one way or the other. Interesting. I knew about the rotating tendency, but what made me question it was when it was having trouble. I can hover and spin (pirouetting?) in both directions at about the same speed, but it's when doing Coordinated turns (am I using that term right? It's when you are using both "rudder" and "aileron" to control your turn angle while in forward flight) that it crops up. When turning to the right and tightening I'll often over rotate by accident, but when turning to the left and tightening the turn it will reach a point where it won't turn any tighter, no matter how much rudder I give. Could this be a user control issue? Could I be adding in to much aileron? I'm not worried to much about it. It is a micro fixed pitch heli that I'm flying outdoors after all. I'm having the same problem with my v911, just with right turns. This is easy to explain: the tail motor isn't strong enough to push the tail further while in a right turn. Left is going just fine because the tail motor just has to slow down then. What's wrong with yours I don't know unfortunately. Well my Heli is now Kaput. I think it's the motor... but it could be the logic board (I hope it's just the motor). Fortunately I was flying inside when it tuckered out (my normal flying area is over our apartment complex's pool/clubhouse). It started to be unable to climb while in the air, and then wouldn't lift back off the ground, sorta like if the battery pack is at the end of it's charge. However, this was with a 1 min old pack. I thought I might have just got a bad charge or something, so I swapped batteries, same result, only this time the tail rotor would spin up properly, but the main rotor would barely spin. I thought I might have picked up some hair or something and it was binding, so I cleaned the motor as best I could. I didn't see any obstructions either. While doing this I also checked the wires for any damage, none. So I'm almost positive it's the main motor that needs replaced. It shouldn't be to hard to swap it out. I've never spliced wires that small, but if I take my time it should be possible. So, I'm grounded for now. Try building one from scratch. I'm already tweaking a rotor hub that I want to mill out of aluminum. 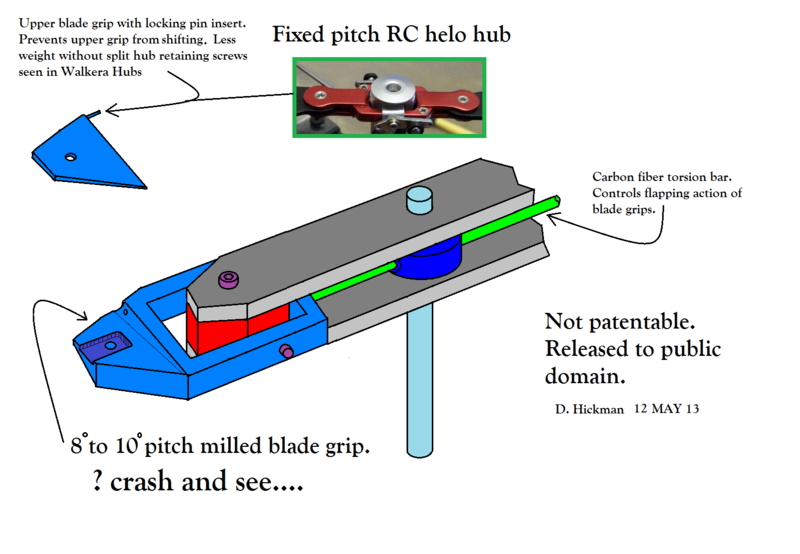 RC helos have always had either collective pitch with flybar paddles to negate dissymmetry of lift or with fixed pitch the cyclic feathering with a fly bar and span wise axis parallel inside the hub. I've always wondered why RC helos never utilized flapping and lead/lag hinges until they came out with what they call a "free floating" hub for the larger multi-blade helos. Here's a rough sketch...sorry..MS paint is not user friendly.